Discussion in 'E39 (1997-2003)' started by suss1173, Sep 14, 2008. I own a 2001 Titanium silver 540ia sport with 101,000k miles. It has premium and cold weather packages, (BMW) disc changer in the trunk, the only options the car doses not have are navigation, and park distance control. Water pump, thermostat, alternator, serpentine belt, mass air meter, cam position sensors, oil and filter have been changed every 5,000- 6,000 miles with BMW synthetic oil. The car was on autotrader.com and cars.com, but I have only had calls from used car dealers, tire kicker, or people that dont know the diff between a 540-and 540 sport or 530. Have you listed the car in the Roundel issue's? A CCA member would plunk down at least $13.5 for it. If it were 6-speed, she would have been sold already. Thant is what I thougt, I'm asking $13,500. thanks for the feed back. My 2002 5401a has been sold "in my mind" at least 3 times in as many years. The problem is, every time i drive the car i love everything about it. 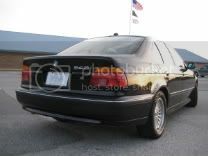 I love the handling, acceleration, and style over anything BMW has come up with in the 5 series since. For the money, there simply is no better sedan out there. i'll put up with the cup holders for a few more years. i'll put up with the cup holders for a few more years. You have a great point, it's a great car for the money and I think the best 4 door car you can buy for the price, power, handling, and style. However my wife is going to win on the new car debate so the 540 must go. If anyone know someone looking for one like mine, please feel free to pass along my info. I love the titanium E39. I wish I had the cash, I'd take it. I was being facetious. I never mentioned the word flaw. But, your son is very cute. I'll be selling my wagon 540it with 114XXX soon, I think a good price would be at around $14,000.00 and come down a bit. I've dropped mine from $19k to $15k trying to sell her. Mine has 67k miles, 19" rims, new tires, 03 front and rear fascias. etc. Plenty of bites, on one has come thru on the money. Any one?? $13,500 ----OBO--Any one have an offer??? Thanks for the feedback. I think you are correct on both the 100k and the fact most people think of a new car coasting $25k-$30K. However any one with bimmer knowledge knows this car new was $60k and any BMW that is maintained will last long past 150k miles. I hate to trade it in , but my wife is on my case and wants the new truck here... She thinks I'm trying my best to hold on to the car, but it must go and if I trade it in, I'll save about $1,100 in taxes on the X5. How much did you end up getting for it? My rims are 19" staggered.